Sly and the Family Stone are credited as one of the first racially integrated bands in music history, belting their message of peace, love and social consciousness through a string of hit anthems that fused R&B, soul, funk and rock n roll. On ‘Different Strokes by Different Folks’ a stylistically, culturally and racially disparate group of chart-toppers mirrors that idealistic diversity. 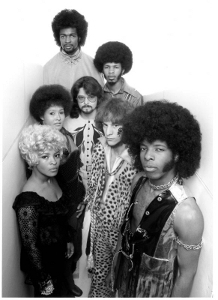 Understand this: There was no precedent for Sly & the Family Stone. Back in 1967, when the interracial, mixed-gender combo burst onto the scene with their debut album, the burgeoning rock & roll subculture was, as always, hungry for fresh kicks and different sounds. But no one was quite prepared for the magical, multi-faceted musical mix Sly and company served up. Their music was an inspired blend of rock, soul, pop, jazz, and an emerging genre soon to be dubbed funk. It packed a powerful, joyous wallop, delivering all the things one hoped to find in music: The thrill of the new, the excitement of the unexpected, a galvanizing groove, and lyrics that actually said something. Sly’s been sampled by Janet Jackson, Beastie Boys, Kid Rock, Fatboy Slim, Ice Cube and Public Enemy to name just a few! He was inducted into the Rock & Roll Hall Of Fame in 1992, and is the recipient of the 2002 R&B Foundation Pioneer Award. merci.. linux and gzip makes all the tricks and the magic.. i’m just trying to control it and spare me the time, to select carefully and with taste, the content. i’m glad that you like, what we make here..stay tuned .. there is much more to come..